Earn $3 per survey at PineCone Research, one of our Top 5 Survey Site Picks. Also occasionally sends products for testing. Quick Cash Hack – Bundle survey signup bonuses for $17 – $5 each at Swagbucks, FusionCash, InboxDollars plus $2 at Vindale Research. Ta-da! Then take the surveys for more. No wheels? Credit iffy? You can still drive for Uber and earn up to $25/hr. or more. Here’s how. 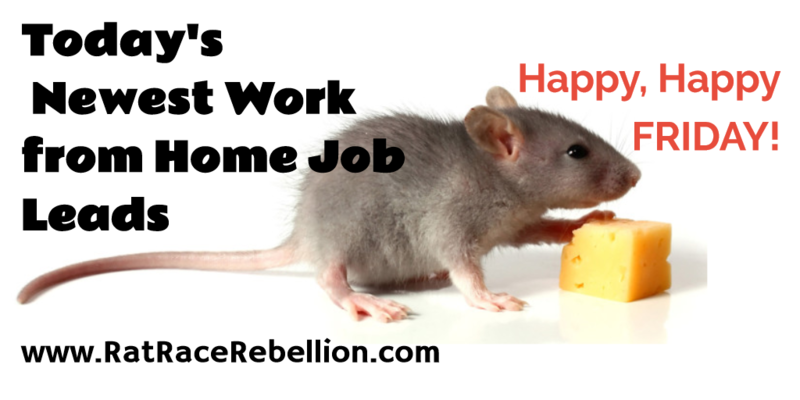 Hear about jobs & gigs before anyone else! When we post here, we immediately alert the Rat Race Rebels at Facebook. Don’t miss out – join us there now! ♥ Share the love! If you know someone looking for a WAH job or extra cash, please share this page. They’ll love you and we will too! Thanks! PS – We use screened affiliate links on RRR pages to buy cheese crumbs for the rebellious rats (that would be us) and keep the computers on. Yay!